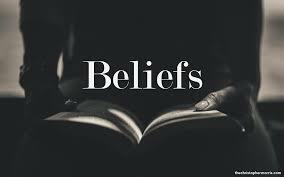 Beliefs change the way we think and act, and that can change the way we live our lives. It is important to know what we believe because when we face a hard decision in life we can know what choice to make based on our beliefs. Our beliefs are formed usually during our childhood when we are taught certain things. Our beliefs shape our actions because when we believe something, when we make a choice, we use that belief to make the choice. For example, If you had the decision to do drugs, but you were taught that they are bad for you, you will probably not do them. The End is Halfway Upon Us!